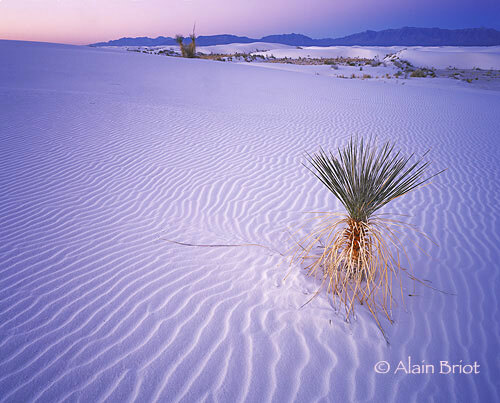 If you have been waiting to register for the 2020 White Sands Workshop this is the last call. Take action now before it sells out! Click here to read the detailed description, dates and pricing. 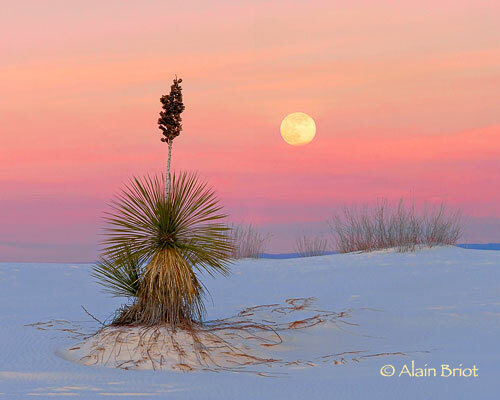 If you have been waiting to register for the 2020 White Sands Workshop this is the time to do it. Take action now before it sells out! Click here to read the detailed description, dates and pricing. The April Print of the Month is available. Click here to discover which image I selected for this month. A photograph from our just-completed Joshua Tree Workshop is now featured on this page. This was a fantastic workshop with great participants and great weather. A big 'Thank you' to all who attended and joined us on a fine art photography learning journey. Joshua Tree Fogged Sunrise: Before & After. We had fog at sunrise the last morning of the 2019 Joshua Tree workshop. 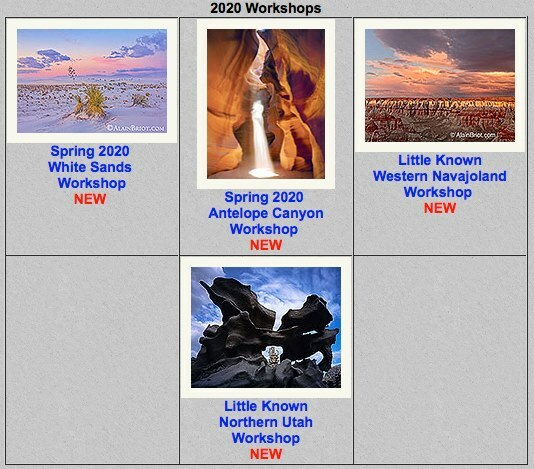 The Workshops Page was updated today with new workshops and openings. "I just wanted to say thank you for a fantastic workshop. I admit I was a little hesitant about joining a workshop with someone I have not met before, however, I was pleasantly surprised. made this workshop second-to-none and a valuable investment to me. Your scheduling and organization of the workshop was flawless. made this workshop a clear winner. It was definitely worth the money and more." The March print of the Month is available for order. Click here to discover which image I selected for this month. 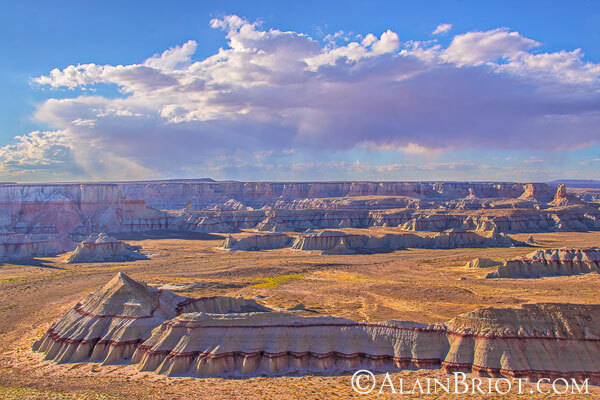 Little Known Western Navajoland and Grand Canyon. 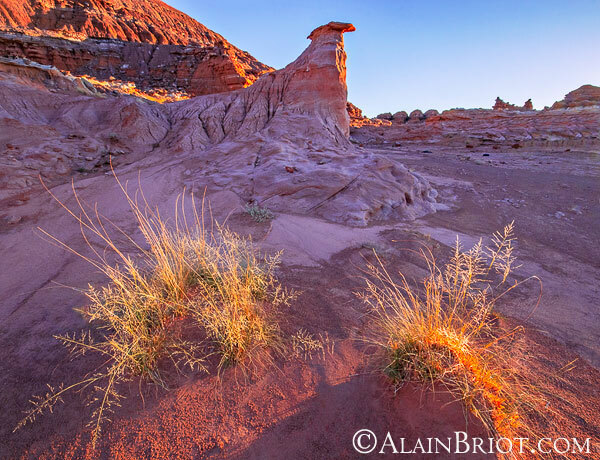 Join us for a Little Known Workshop and discover areas of Navajoland you never knew existed. The Online Portfolio Galleries were updated with new photographs. The galleries that were previously listed as a 'work in progress' are now populated with new images. A total of over 300 new images were added to the online galleries. 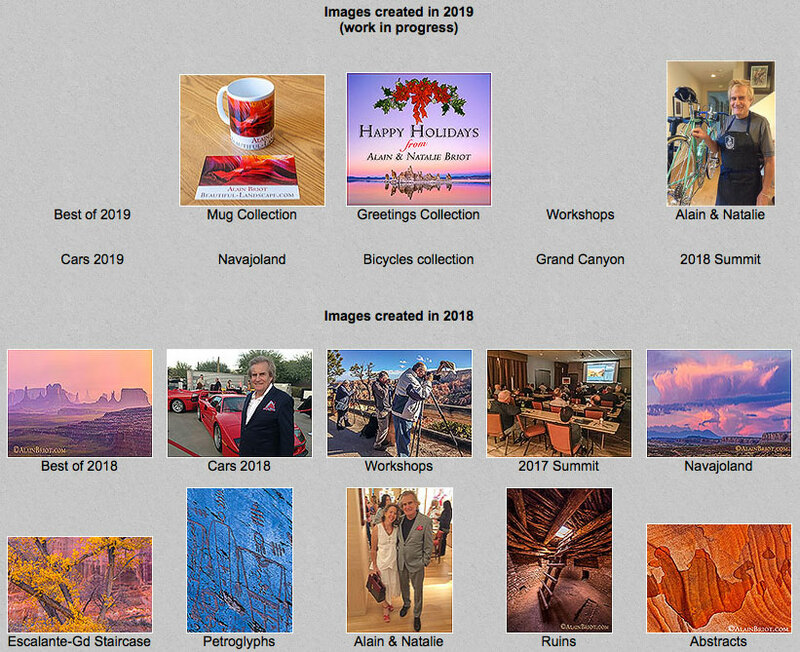 The selection, conversion and optimization of this huge number of photographic images represents a massive workload that kept me busy for the past several months. The February 2019 Print of the Month is available. Visit this link to see which photograph I selected for this month. Due to a cancellation we have 1 seat available for the Joshua Tree Workshop this March. Our Start the Year in Style Special Offer is live! 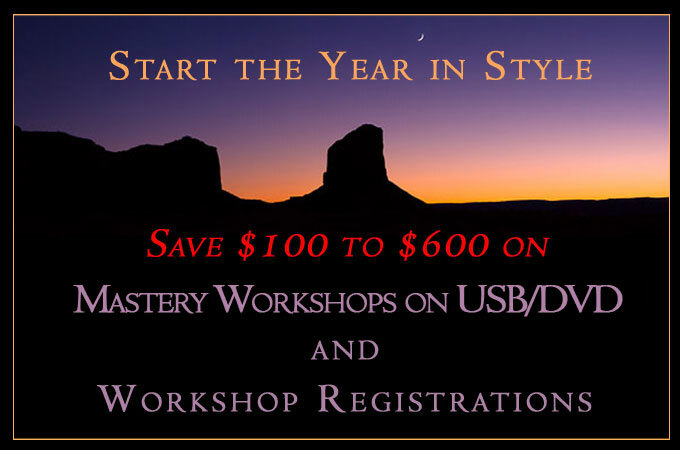 Save $100 to $600 on Workshop and Summit registrations and 20% to 50% on Mastery Workshops on USB/DVD ! New Portfolios are being added to the Online Portfolios Page. This is a work in progress at this stage so come back often to see which new images I will be adding next. 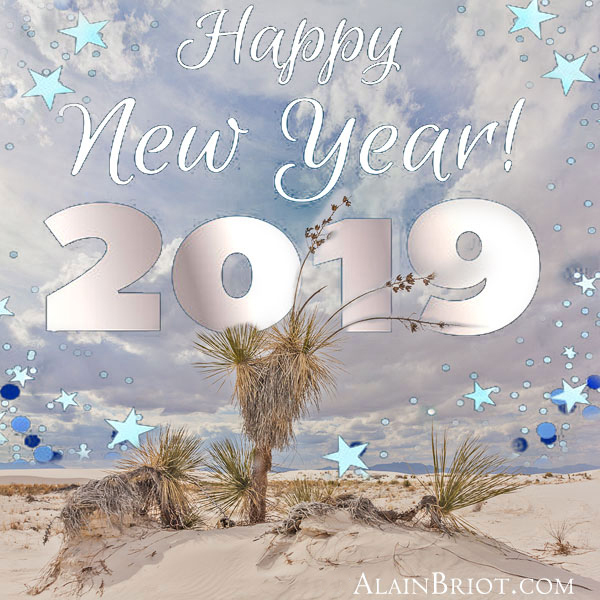 Natalie and Alain wish you a Happy New Year ! 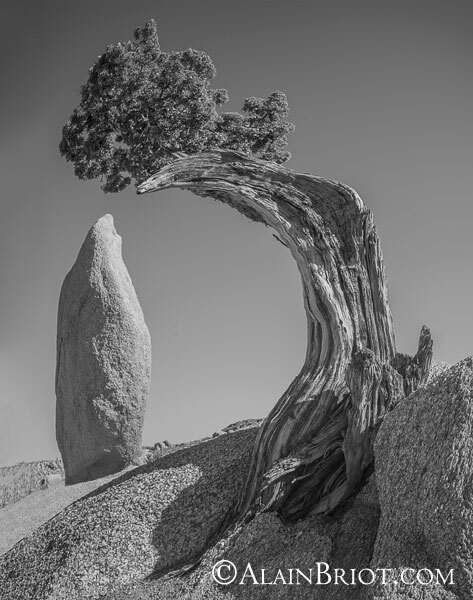 The openings for the 2019 Joshua Tree Workshop and Alumni Rendez Vous are now taken. 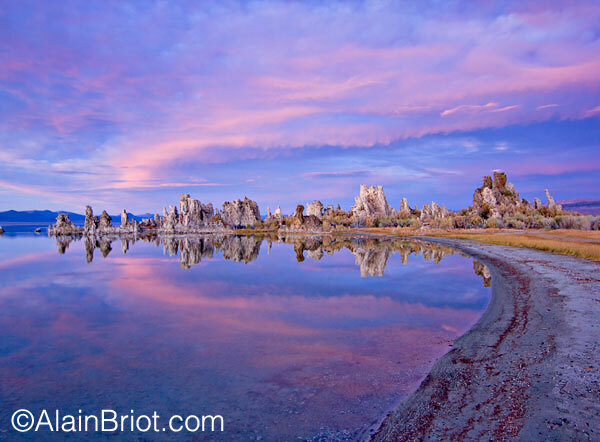 The last workshop opening is for the 2019 Eastern Sierra and Mono Lake Workshop. We wish you a Merry Christmas and a Happy Holiday Season. Thank you for your support this year and before. 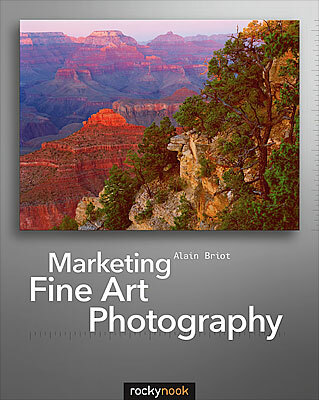 We look forward to continuing furthering your passion for Fine Art Landscape Photography! "Your new Artistic Composition Mastery DVD/USB is a real winner! Thanks for all the effort and knowledge you put into it. 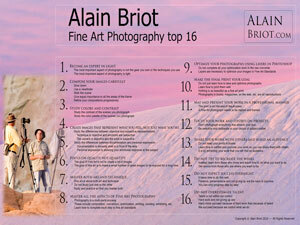 My Fine Art Photography Top 16 is now available as a wallpaper for your computer monitor or iPad. This free download comes in 7 different monitor resolutions (from 30" to 12"), plus iPad resolution (1024x768). It is available in English and in French. Below is a small jpeg of this wallpaper. You can download it now at this link. I just wanted to let you know that I am very much enjoying the Mastery DVD training videos which are truly excellent and well worth the investment. The workflow is comprehensive and logical and all the little tips are invaluable.The more of the DVD's that I see the more I am enjoying them and the more I get out of them. I am very surprised at how much really useful information and great tips that I am getting out of them. Too many training videos focus on the "how".......move this slider to the right etc, rather than on the "why". Your comments on adjusting colour by adding and subtracting other colours are really great and not something I have come across before, but they really make sense and make understanding the whole process much simpler. I am most interested in your comments on selective color and color theory. I was glad you went into detail on the DVDs. I was inspired to continue learning this topic. I was also able to dramatically improve the quality of my prints which is what I wanted to get out of the dvd. I did several before and after prints. that we can all learn from. it has also inspired me to try even harder to sell my work. I am excited about holding my own exhibits in the near future! Of all the photography workshops and classes I've attended, the Route 66 experience opened the door to unexpected forms of creativity. I am very happy with the images I produced on that trip. In fact, I ended up with more interesting images from that workshop than from any other. I am still on a high from my wonderful time with both of you. It was very, very special to be with you in the Navajo country. I am about half way through your new book and very impressed. You have done a great job with it and I am finding the concepts very helpful. Thank you for writing such a great book. I am really enjoying it. Your photo of the stars rotating around Polaris is wonderful. I'll make this short: if you are a student, an emerging or a professional photographer just wanting to improve your bottom line, read this book. The author is personable and helpful and the text is enjoyable. Although I do not envision selling my work anytime in the near future I bought Marketing Fine Art Photography figuring there would be some useful info that I could apply in the workplace somehow (personal brand, etc). I have so far read Part 1 & Part 2 (Chapters 1-8) and I can say that the book is more than I expected (not that I have low expectations for any book from Alain based on all the previous ones). I found that these first 8 chapters contain much information that causes me to think differently about my work and artistry in general and gives me energy to do some different things in the future. Good stuff Alain!